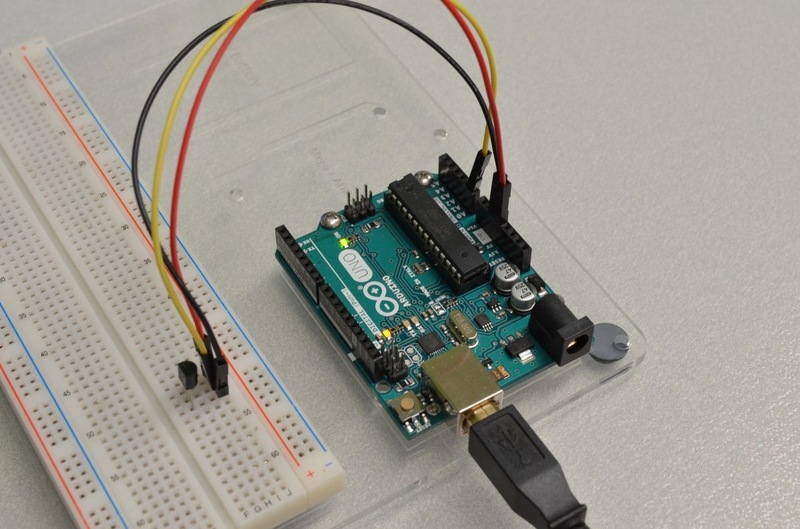 The TMP36 temperature sensor is an easy way to measure temperature using an Arduino! The sensor can measure a fairly wide range of temperature (-50°C to 125°C), is fairly precise (0.1°C resolution), and is very low cost, making it a popular choice. In this tutorial we will go over the basics of hooking the TMP36 up and writing some basic code to read the analog input it is connected to. • This sensor is not weatherproof, so it will need to be shielded from direct exposure to the elements. 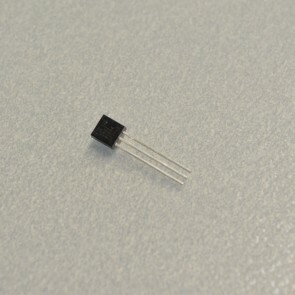 Unlike a thermistor, the TMP36 does not have a temperature sensitive resistor. Instead this sensor uses the property of diodes; as a diode changes temperature the voltage changes with it at a known rate. The sensor measures the small change and outputs an analog voltage between 0 and 1.75VDC based on it. To get the temperature we just need to measure the output voltage and a little bit of math! We have also used one of our full sized Arduino Mounting Plates in this tutorial. The mounting plate keeps your Arduino fixed in place, allowing for much more organized prototyping! This handy little diagram shows how we will be connecting everything. Don’t worry if it looks a little overwhelming, we will be going through this step by step! 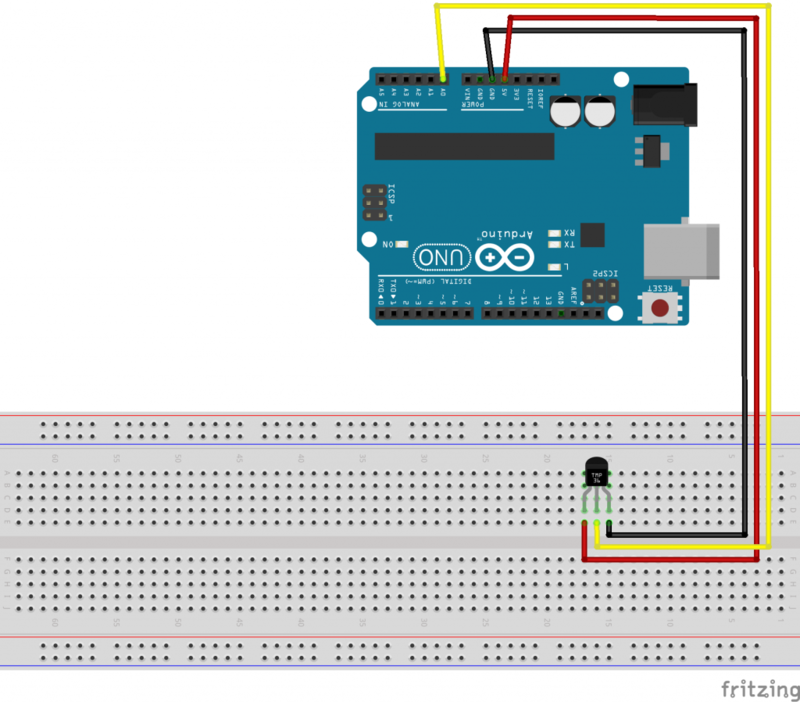 Since this sensor is very simple and does not require any supporting components we will be directly connecting the sensor to the Arduino. Start by bending the legs on the TMP36 sensor so they will fit into the breadboard. 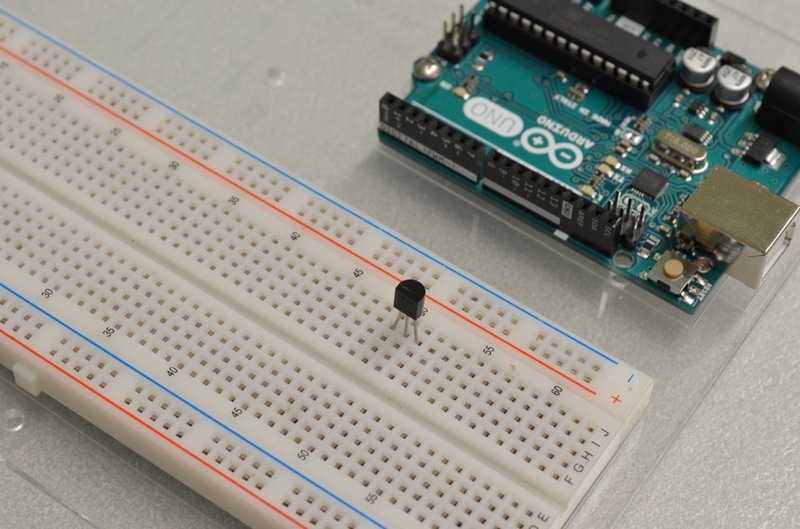 We are going to be using one of the Arduino’s analog input pins for this tutorial. 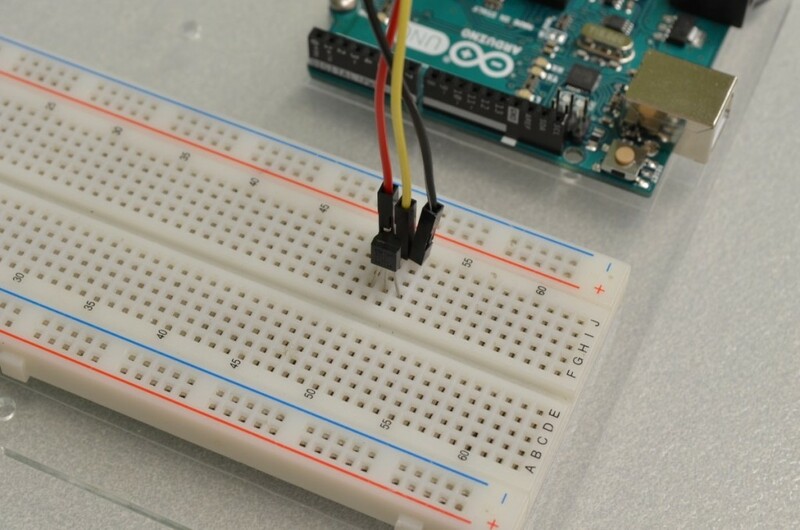 Run a jumper wire from the sensor’s “pin 2” (the middle pin) to an analog input. We will be using analog input 0 in this tutorial. Step 4 – Double Check And Plug It In! 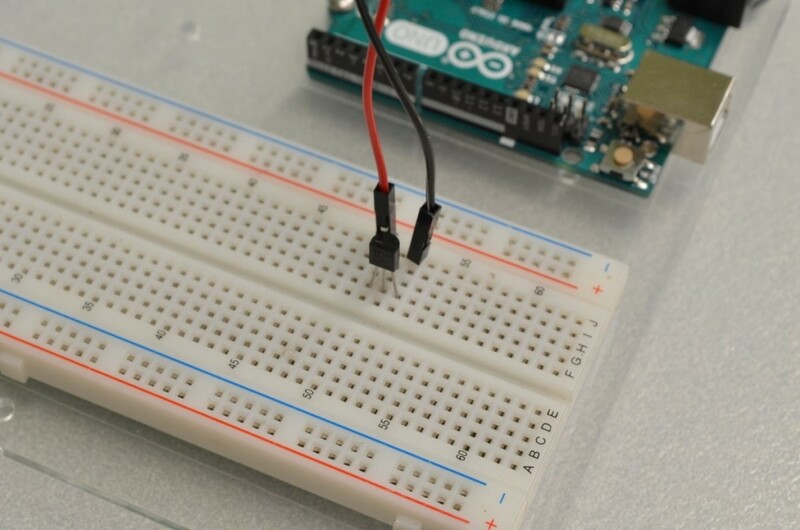 Before we give the Arduino power it is always a good idea to go over all of the connections to make sure there are no wires in the wrong spot – sometimes that can make for a very expensive mistake! We will start with the “BareMinimum” sketch found by clicking “File” and selecting Examples / Basic / BareMinimum. This sketch is a great starting point as it includes the Setup and Loop functions – we will write the rest! This sensor is very easy to read – the sensor does all of the hard work so all we have to do is read the output. Since the output voltage is an analog voltage proportional to the temperature we can do some very basic math to take the voltage and turn it into a number that makes more sense. double temp;        //The variable we will use to store temperature in degrees. We plugged the sensor into analog input 0 so we will declare this as a variable – this will make it much easier to change in the future if we ever decide to change which pin the sensor is plugged into. We also need two variables for the data; 1 will store the initial input from the analog input, and the other will store the temperature once we have converted it to decimal degrees. Arduino analog inputs do not need to be configured in the Setup loop, so we will just add some code for starting the serial connection we will use to output the data. Ok now we can read the sensor, this will be done in the loop. 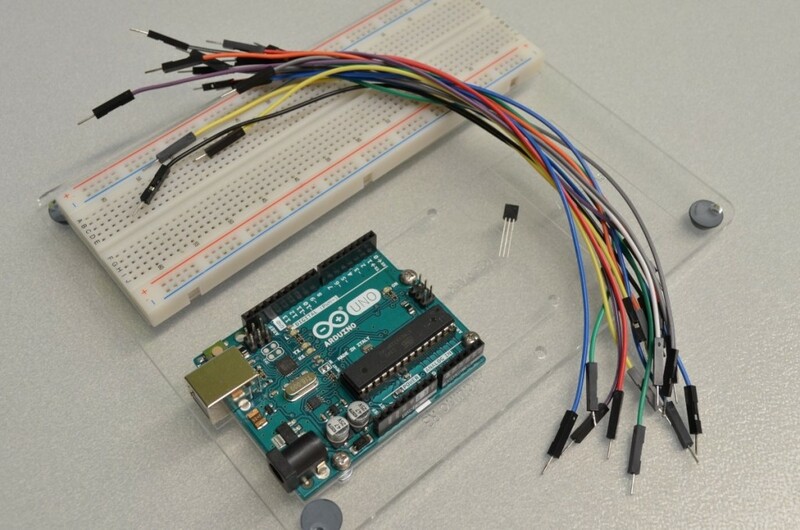 Reading analog inputs is very easy with the Arduino – just that one line of code! The analog input gives us a value between 0 and 1023, 0 being no voltage and 1023 being 5V. To figure out what this voltage converts to in degrees Celsius we will need to first find the percentage of 5V on the input. This can be done by dividing the sensorInput by 1024. 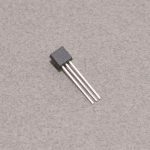 As we know from the datasheet, the sensor will output 0 – 1.75V over a range of 175 degrees (-50° to 125°) so that means every 0.01V equals 1 degree. We will need to convert the percentage of input to voltage by multiplying by 5V. To convert from millivolts to degrees Celsius we will need to multiply by 100. Now that we have degrees, let’s output it via serial so it can be seen from the Arduino Serial Monitor. That’s it – we are all done. 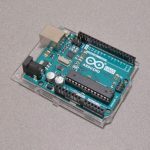 Now that all of the code has been written it can be uploaded to your Arduino! 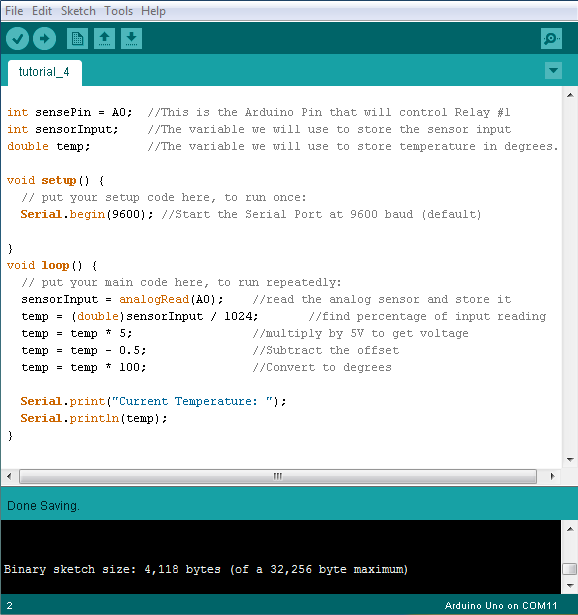 Click “Upload” button in the top left corner of the Arduino IDE and it should upload without any issues. Next, click the “Serial Monitor” button in the top right corner (it looks like a magnifying glass). After a few seconds you should start to see a stream of data appear in the window – that is your temperature in degrees Celsius. If you have any questions, or need further clarification please post in the comments section below; this way future users of this tutorial can see the questions and answers! aurdino due convert voltage to temperature from ad8495 16bit and output 5mv/degree C. can anyone send me the code for this. Good Catch – Copy/Paste strikes again! Thank you so very much for your excellent illustrations, the pictures are very clear with no “blurryness” I had no problem whatsoever understanding exactly how to use a TMP36 to work with an Ardunio using your MOST EXCELLENT diagrams. Thank you so very much for all the time you put into this. I am using a single Arduino board to hook up the temp sensor and a fan powered using a transistor from one of the digital I/Os. Whenever power is supplied to the fan, the temperature sensor sees a jump in temp (jump in voltage). Why is this occurring and how do I fix the problem? Thanks! Looks like the readings are quite arbitrary.. Does anyone have the same issue? I found online that a resistor (41.7K) should be connected on the TMP36 analog output pin. Personally – i wouldn’t rely on the TMP36 to be anything more than a rough approximation. It is an easy sensor for people to learn with but if you are concerned about what the temperature actually is, there are far better options. 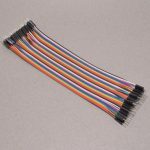 I am a fan of using thermistors and thermocouples – all of these IC based temp sensors tend to read warm due to the internal heating of the onboard circuitry. HI! I’m having problems every time i run the program it comes up with minus temperatures plz help.